La Reserve Vedado Havana is a charming, beautifully-restored colonial house located just on the outskirts of bustling Havana on a residential street. 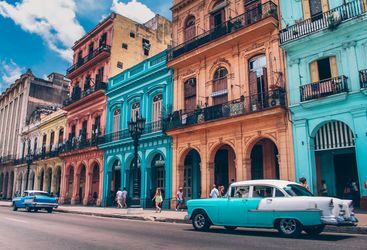 The vibrant experience of Cuba’s capital is clearly reflected in the art and design within its walls, and its privacy and character will make you feel right at home; like you’re one of the locals. This boutique house offers a selection of nine luxury rooms and suites. The property proudly displays a selection of work by contemporary Cuban artists plus, with graphically tiled floors throughout the house and a balance of minimalist design with antique furniture, each room has its own identity. All rooms feature air-conditioning, bathrooms, flat-screen TVs and some units even have their own balcony. There is a continental breakfast available every morning at the hotel, and although there isn't an in-house restaurant for the evening you are within close walking distance from a handful of fantastic eateries. Once you have finished your activities for the day and want to relax, head to the tropical outdoor seating area and bar where you can eat, drink and unwind. Located in the cosmopolitan Vedado district, you are truly in the heart of the action, giving you chance to also explore Havana on foot. Venture out a little further on your walk, or take a short drive out of Old Havana, and you'll find Castillo de San Salvador de la Punta and La Bodeguita del Medio. The house is perfect for guests that interested in all of the attractions, local food and sandy beaches, but who are after privacy and an intimate feel to make a home away from home. Will is our 'La Reserve Vedado Havana' expert and as a seasoned traveller has the inside track on the most memorable adventures.